Emily Wierenga's “A Promise in Pieces” Shopping Spree Giveaway! The latest Quilts of Love release, A Promise in Pieces by Emily Wierenga is receiving glowing reviews. Emily is celebrating the release of her debut novel with a "Women Helping Women" shopping spree giveaway. Enter today by clicking one of the icons below. But hurry, the giveaway ends on May 10th. 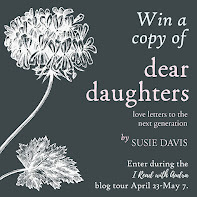 Winner will be announced on the Quilts of Love blog on May 12th. 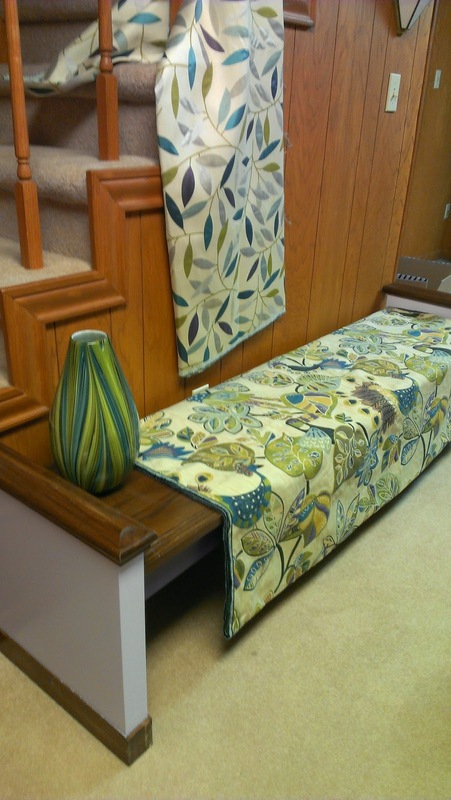 Then be sure to stop by the Quilts of Love Facebook page on May 29th for the "Quilting Bee" Facebook party with Emily and other Quilts of Love authors. RSVP for an evening of book chat, quilting tips & tricks, prizes, and more! Spread the word—tell your friends about the giveaway via FACEBOOK or TWITTER and increase your chances of winning. It’s been more than 50 years since Clara cared for injured WWII soldiers in the Women’s Army Corp. Fifty years since she promised to deliver a dying soldier’s last wish. And 50 years since that soldier’s young widow gave her the baby quilt—a grief-ridden gift that would provide hope to countless newborns in the years to come. On her way to the National World War II Museum in New Orleans, Clara decides it’s time to share her story. But when the trip doesn’t go as planned, Clara wonders if anyone will learn the great significance of the quilt—and the promise stitched inside it. 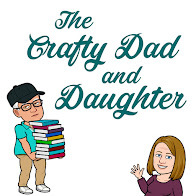 Emily Wierenga is a former editor, ghostwriter, freelance writer and staff journalist, a monthly columnist for “The Christian Courier,” and the author of “Save My Children,” “Chasing Silhouettes,” and “Mom in the Mirror.” Emily and her family reside in Alberta, Canada. This is her first novel. Find out more about Emily at www.emilywierenga.com. Guideposts Books is excited to announce the premiere of a new film based on the book Love Finds You in Sugarcreek, Ohio (Summerside Press) by Serena Miller. The movie, produced by Mission Pictures International and filmed last fall on location in the town of Sugarcreek, will premiere on Sunday, June 1, 2014 at 7:00 PM EDT on UP TV. The program will re-air later that evening at 11:00 PM EDT. 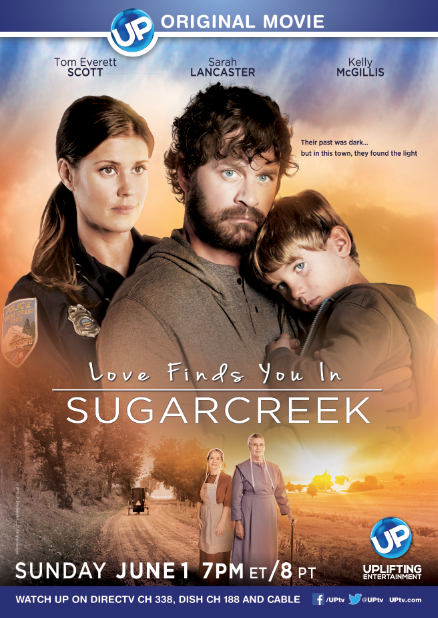 Love Finds You in Sugarcreek stars Sarah Lancaster (best known for her role in the TV series Chuck) and Tom Everett Scott (That Thing You Do and Parental Guidance). When a mysterious outsider casts a long shadow on Ohio’s Amish country, policewoman Rachel Troyer (Lancaster) becomes suspicious. Rachel has always looked after her three elderly Amish aunts (with Kelly McGillis of The Accused and Witness fame in one of the roles), proprietors of a farmhouse inn near Sugarcreek. The idyllic town is popular with tourists, who come to sample its famous Amish goods, but one thing is clear to Rachel: Joe Matthews (Scott) is no tourist. When the bearded stranger lands on her aunts’ doorstep, begging shelter for himself and his young son, Rachel’s instincts kick in. Will she be able to uncover Joe’s secrets despite her aunts’ — and her own — growing affection for him? "This is so exciting for Serena Miller and Guideposts! We are thrilled that Up TV has chosen Love Finds You in Sugarcreek, Ohio to make into a movie,” said Lenore Lelah Person, vice president and editorial director of Guideposts Books and Inspirational Media. “With Serena’s wonderful story and a beautiful backdrop in Ohio Amish country, fans of the story and the series will enjoy seeing it on screen. For those who are not familiar with the Love Finds You™ series, this will be a great opportunity to introduce them to these uplifting and engaging romances." Love Finds You in Sugarcreek, Ohio is one of more than 50 releases in the popular Love Finds You™ series published by Guideposts Books under their Summerside Press imprint. The Love Finds You™ series is uniquely titled after actual American towns with unusual but intriguing names and combines travel, romance and faith in one package. The series includes both historical and contemporary releases, and each fictional story draws on compelling history or the unique character of a real place. Stories center on romances kindled in small towns, old loves lost and found again on the high plains, and new loves discovered at exciting vacation getaways. Mission Pictures has purchased the movie rights to the entire series and plans to produce additional films based on the series in the future. Author Serena Miller grew up in an Ohio farming community similar to Sugarcreek and lives in the 1830s log cabin that has been in her family for five generations. She was delighted when an Amish community formed not far from her home and has enjoyed getting to know these hard-working people. Her Amish neighbors have provided great inspiration for three of Miller’s novels thus far. “Getting to watch my book, Love Finds You in Sugarcreek, Ohio, being turned into a movie has been one of the most exciting things I've ever experienced. The script writer did an amazing job of focusing on the heart and message of my story and Mission Pictures International chose amazing actors. It was wonderful getting to watch professionals bring to life characters who had previously only existed in my imagination! After stumbling through the cameo role they gave me, I have an even greater respect for what true actors make look effortless,” stated Miller. She shares more about her time on set at http://serenabmiller.com/journal/. To catch the June 1 premiere, UP TV can be found on DirecTV channel 338, Dish Network channel 188 and cable systems around the country. Love Finds You in Sugarcreek, Ohio is currently available in both paperback and ebook versions on www.ShopGuideposts.org, as well as in bookstores and from online retailers. Learn more about the film and watch the trailer at http://lovefindsyouin.com/. Serena Miller and her minister/carpenter husband live in the same southern Ohio farming community where they both grew up. Three grown sons, two daughters-in-law, and three grandchildren live nearby. She was delighted when an Amish settlement formed not far from her home, and she has enjoyed getting to know some of the families. Miller decided to get serious about writing fiction while she was working as a court reporter and found herself developing an overwhelming desire to compose a happy ending for every transcript she typed. 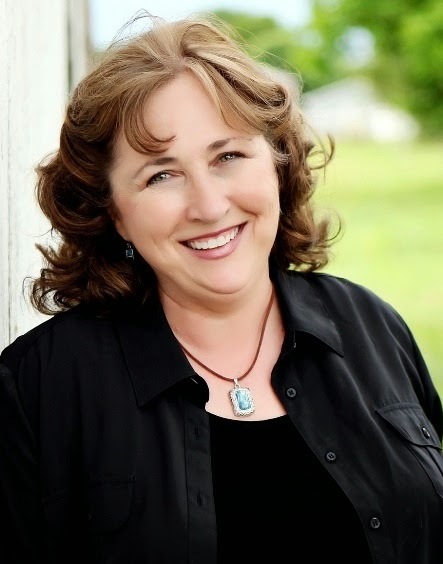 She has now published six novels, including three Amish releases. She is the recipient of both a 2012 RITA Award and 2013 Carol Award. 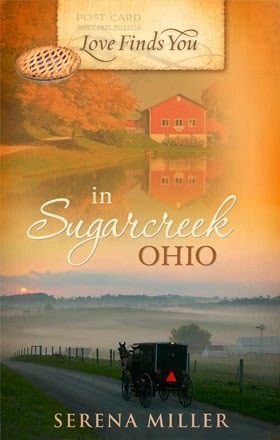 Miller’s first Amish novel, Love Finds You in Sugarcreek, Ohio (which was also her debut release), is currently being made into a movie for UP TV. Her second Amish novel, An Uncommon Grace, explored the world inside the most conservative Amish sect of all — the Swartzentrubers. The third novel, Hidden Mercies, was inspired by an Old Order Amish friend, a practicing midwife for nearly 40 years. Unlike her more talented Amish friends, she has no skill in quilting, sewing, canning, or gardening . . . but they are kind enough to let her write about them anyway. Learn more about Serena Miller and her books at www.serenabmiller.com, via her Facebook page (AuthorSerenaMiller) or by following her on Twitter (@serenabmiller). When caring for a baby it often becomes difficult to focus completely on God. When exhaustion sets in and the baby is crying, prayer and meditation tend to take a backseat. When nap time dictates your daily routine, going to the weekly women’s Bible study is often the first thing taken off the calendar. When mother and author Julia Roller’s first son was born, like all new moms, her world was changed in more ways than she ever could have imagined. Perhaps most surprisingly, she found herself unprepared for the impact motherhood would have on her spiritual life. 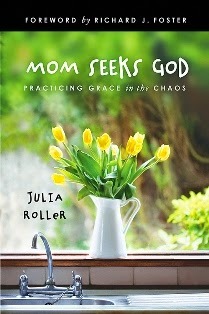 In her new book Mom Seeks God: Practicing Grace in the Chaos (Abingdon Press/April 1, 2014/ISBN: 9781426771026/$15.99), Roller inspires other mothers by sharing about her struggles as a new mom and how she was able to reconnect with God by reintroducing spiritual discipline into her newly changed life. Q: How did the birth of your first son change your perspective on God and your spiritual life? Today I would say that motherhood has brought me closer to God, that the love you feel for your child is such a concrete reminder of the love God has for us, but I didn’t feel that way in those first few weeks and months of motherhood. Before I had Ben, I truly thought of myself as a pretty good person. Sure, I knew I needed forgiveness for numerous little sins, but when it came to the big things, I thought I had things fairly well-covered. Ha! Then I had a wonderful, beautiful little baby and he never slept and he wasn’t gaining weight. I couldn’t seem to do anything right, and I felt so alone and so depressed. I came face-to-face with my own sinfulness and selfishness in a way I never had before, yet I no longer felt like I had access to those ways of meeting God that had come so easily in my pre-motherhood life. I didn’t react to this challenge the way I would have hoped, either, with patience and calm and bringing it all to God. Instead I couldn’t think about anything more than getting things back to the way they had been, and then I felt a continual sense of shame about feeling that way. I felt far from God. I felt unworthy, and I didn’t seem to know how to get back in touch with God. I knew I had to change something, so I embarked on this journey of trying to figure out how to meet God in my new life as a mother. Q: Was there one particular mothering moment that made you realize your spiritual relationship with God was suffering? Four weeks after I had Ben we realized he wasn’t gaining weight; he was actually dropping weight. I still have trouble looking at pictures of him from that time; his little face was just skeletal. I started on a difficult and time-consuming nursing and pumping regimen. What I remember most from that time period was sitting on the couch trying to pump while Ben sat in his swing or infant seat and just wailed because I wasn’t holding him. Most of the time, we wailed together. I was so exhausted and felt like such a failure for not even being able to feed my own baby. We had just moved to a new town the year before, and I didn’t know any other moms, plus my husband was working long hours. I felt so alone, and there didn’t seem to be any end in sight. I felt so ashamed of these feelings that I didn’t feel like I could bring them before God. As a result, I started to grow more and more disconnected from God. That was a terribly dark period for me, and it came to an end, thankfully. I realized a lot of my depression had been connected to a medicine I’d been prescribed to increase my milk supply. But I’d already begun this pattern of not coming before God with my immediate concerns, and I found, sadly, that it’s easy to get out of the habit of prayer. A year and a half or so later, when I was writing a daily devotional about spiritual practices, I started to realize how few spiritual practices I had left in my life. I didn’t have any consistent time of prayer, I was no longer in a Bible study group, and I certainly wasn’t studying the Bible on my own. I wanted to have a relationship with God that my son could emulate, and I just didn’t. 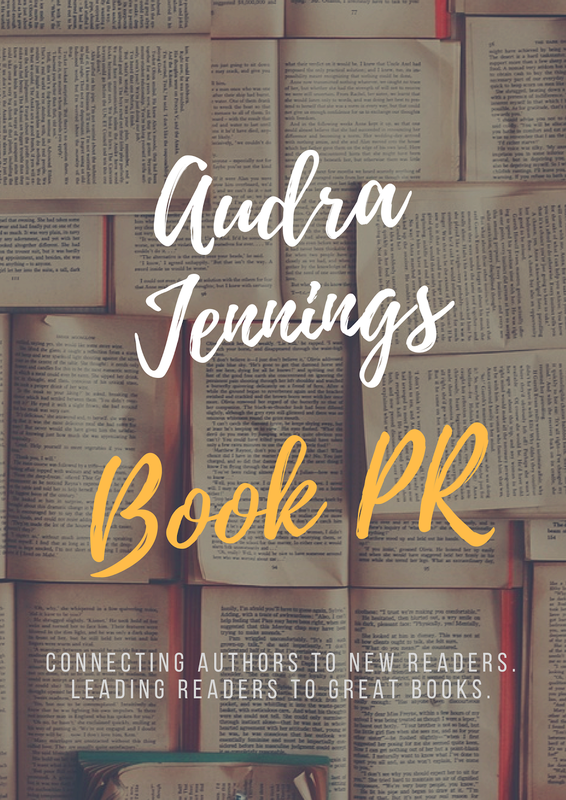 Q: What makes your book different from the other books out there offering encouragement for women overwhelmed with the busyness of family and motherhood? I love to read other women’s stories. I find so much hope in knowing I’m not alone in my struggles. This is my story, but what I hope this book also provides are some helpful, practical steps to connect with God even when you feel as though you have no more time or energy to do so. One of the things my book offers is a framework based on spiritual disciplines. I’d been writing about the spiritual disciplines for years by the time I had a child. So I had a lot of “head knowledge” about why I should be engaging in these practices, but with the life-changes necessitated by motherhood, I was really struggling to incorporate these practices into my life. Each chapter of the book describes my effort to practice one spiritual discipline in particular: prayer, study and service are a few examples. And I’ve summarized what I learned about each at the end of the chapters in what I call in the book “non-expert tips,” because I felt as though I was starting at the beginning again with trying to fit these spiritual practices in my new life as a mom of a small child. So I think it’s very easy to read the book one discipline at a time, and it makes it easy to read with a group too. Q: You have worked with Richard J. Foster who is best known for his book Celebration of Discipline, and his ministry. How did practicing those same disciplines he talks about prepare you for motherhood? You know, I tried so hard to prepare myself for motherhood, but I don’t think anything can quite get you ready for it! And that’s true in both challenging and rewarding ways. But yes, Richard’s books, mainly Celebration and Prayer, had changed my life, and I had been trying to practice spiritual disciplines for some time before having a baby. Initially that made things harder because I couldn’t practice them in the same way after becoming a mom — I didn’t seem to have time for prayer and study, and silence was just a fantasy. Eventually, I began to see motherhood itself as a spiritual discipline, and this idea helped me enormously: to see motherhood as a role designed by God, one teaching me about God and helping me to become more like Jesus. That made so much sense to me. Q: For those in the audience who may not be familiar with what you mean by “spiritual disciplines,” please share what they are and how they apply to our Christian walk. Spiritual disciplines are just those practices Jesus showed us to help us stay connected to God and become more like Jesus. The idea is that once we become Christians, we are not done. We are to progress along the road of becoming more like Jesus, and there are many things we can do, things Jesus himself did and Christians throughout the centuries have done, to help us along the way. The disciplines I focused on in my book were prayer, fellowship, submission, study, simplicity, silence, fasting, worship, service and celebration, but there are many more. For more information about Julia Roller, visit her online home at juliaroller.com, become a fan on Facebook (JuliaLRoller) or follow her on Twitter (@julialroller). Read more about Mom Seeks God here! There aren't many times we have to do a second take, but today was one of those. It also appears that someone wasn't too happy about singing more than one verse. This even though I think this kid picked the song this week. Well, as the week went on, I had to let two car salesman down easy. I'm sorry, but I went another route. For all my big talk, I'm not one for confrontation. The guy who asked about my "boo," got the news via the phone. I figured I better answer or face continual harassment. I think he may have been in shock that I didn't buy a Jeep from him. The saleswoman from the Hyundai dealership emailed about finding the blue car for me (which I had decided I didn't like the blue anyway - it was nothing like the color she told me it was). I told her that she was great, but her sales manager was an intimidating bully who did nothing to help her cause. In other news, we had a family reunion today, but I left my camera and phone in the car, letting my mom and others take all the pictures, if you can believe that. No pictures to post. No family drama. That's always a good thing. Otherwise, pretty uneventful. Welcome to the blog tour for Elizabeth Sherrill’s Surprised by Grace. Best-selling author says of Sherrill’s story, “The master ghostwriter steps from the shadows at last!” In Surprised by Grace Elizabeth shares how God’s love transformed her life from one of great struggle to one with a clear direction and find inspiration, hope and strength for your own journey. 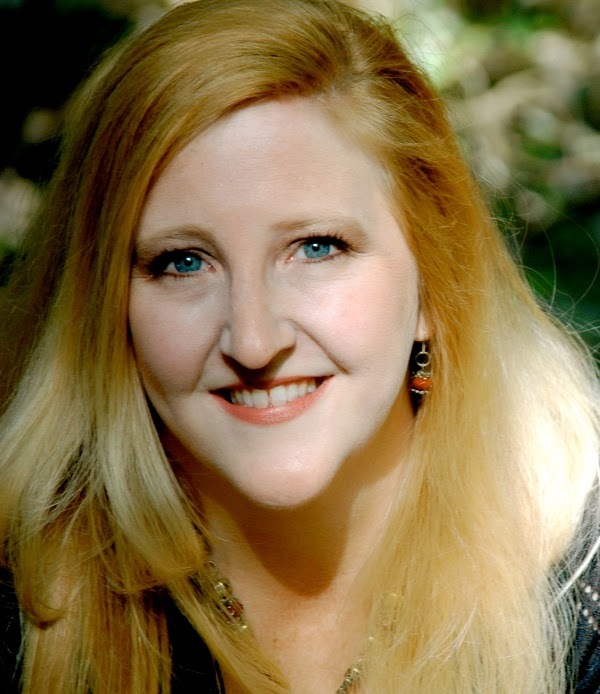 Renowned writer Elizabeth “Tib” Sherrill shares her own faith journey at last! Embrace this page-turner and see God’s work in your life every day. Tib has written for Guideposts magazine for over sixty years, contributed to Daily Guideposts for over twenty-five, and coauthored the best-selling, inspirational adventures of all time with her husband, John, including: The Hiding Place, The Cross and the Switchblade, and God’s Smuggler. Yet, Tib’s most powerful story ever is this beautifully written, exhilarating memoir. In it, you’ll discover how God’s love transformed her life from one of great struggle to one with a clear direction and find inspiration, hope and strength for your own journey. Enjoy touching stories about Tib’s family and close relationships, from her unhappy childhood to John’s surprising marriage proposal. Meet her lifelong friend Mea, and her dear father-in-law who was able to see her for the complex person she was even though he was blind. Travel with her to fascinating places across the United States and Europe. And find out how she overcame her poor self-image after a stunning encounter with her Creator. Elizabeth Sherrill’s superb storytelling brings you into every scene, making you laugh and cry many times over. You’ll be reminded that God intends hope and freedom for you. You’ll also find wonderful insight and encouragement in the uplifting foreword by Guideposts Editor-in-Chief Edward Grinnan and in the inspirational “Conversation Starters,” particularly useful for women’s Bible studies, book clubs, or home groups. Surprised by Grace will help you understand more deeply how to completely trust God in the toughest times of your life, how to recognize your dependence on Him, and how to allow Him to light your way. Purchase a copy at Guideposts and get Elizabeth’s devotional 101 Moments of Prayer FREE. 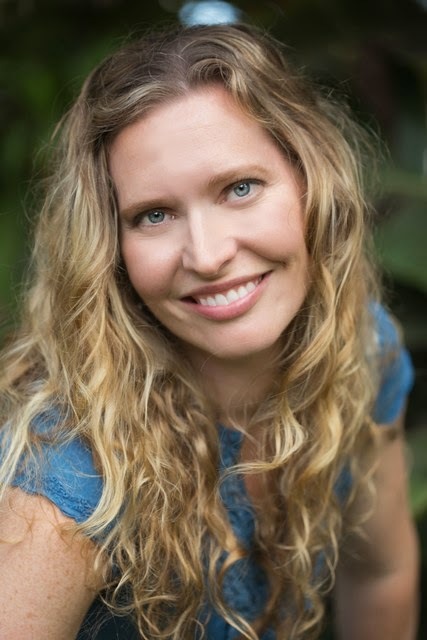 Find out more about Elizabeth at http://www.elizabethsherrill.com. Moms' Night Out - The Novel and Devo! Eager moms and movie-goers alike will have the opportunity to get an early taste of the MOMS’ NIGHT OUT film, starring Patricia Heaton (“Everybody Loves Raymond”) and Sean Astin (“The Lord of the Rings”), ahead of its nationwide release Mother’s Day weekend with the publication of two film tie-ins by B&H Publishing Group. 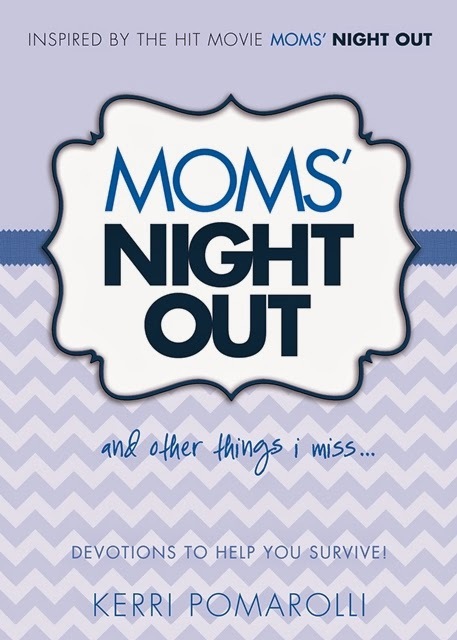 This week (April 22), the publisher simultaneously released a MOMS’ NIGHT OUT novelization (ISBN: 978-1433684821/$15.99), written by award-winning fiction author Tricia Goyer, and a daily devotional entitled MOMS’ NIGHT OUT and other things i miss: Devotions to Help You Survive (ISBN: 978-1433684821/$15.99) by Hollywood comedian Kerri Pomarolli. An endearing true-to-life family comedy that celebrates the beautiful mess called parenting, Goyer’s MOMS’ NIGHT OUT novelization of the film chronicles how three harried moms, their husbands, a sister-in-law with a misplaced baby, a tattoo parlor owner, a motorcycle gang and a bewildered cabbie become intrinsically intertwined in one another’s lives after one momentous moms’ night out. MOMS’ NIGHT OUT and other things i miss is a devotional intended to help moms survive the day-to-day calls to action that aim to define parenting. Inspired by the film, comedian Pomarolli has created this light, yet inspiring devotional that will definitely make you laugh but will also help moms discover they are not without God’s gracious provision. It’s One Night Out, What Could Go Wrong??!! MOMS’ NIGHT OUT by Tricia Goyer is a novelization of the hilarious family comedy that celebrates real family life—where everything can go wrong and still turn out all right. All Allyson and her friends want is a peaceful, grown-up evening of dinner and conversation… a long-needed moms’ night out. But in order to enjoy high heels, adult conversation and food not served in a bag, they need their husbands to watch the kids for a few hours—what could go wrong? Chronicling one night out gone awry, three harried moms, their husbands, a sister-in-law with a misplaced baby, a tattoo parlor owner, a motorcycle gang, and a bewildered cabbie all learn to embrace the beautiful mess called parenting. This book spotlights the unfulfilled expectations and serial self-doubts many moms feel… then reassures us that the key is raising kids in a loving home. 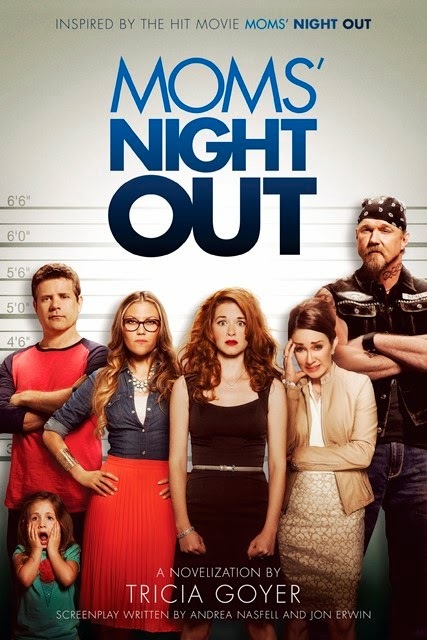 Moms’ Night Out is an endearing, true-to-life comedy. As a mom, couldn’t you use a good laugh? Inspired by the endearing, true-to-life movie Moms’ Night Out, comedian Kerri Pomarolli has created this light, yet inspiring devotional that will definitely make you laugh, but will also help you discover that indeed you are not alone, and that God’s gracious provision of love and faithfulness is at work in your life and of your loved ones. Whether you’re running full-speed-ahead or disappointed that it’s Monday (again), you’ll find joy in these devotions where Kerri shares hilarious stories and insights on daily life. Messy homes, messy kids, lost pets, never ending casseroles, forgetful husbands, and the desire to just take a long bath… This world can be a funny place, and these stories are bound to prove it. Read a devotion to brighten your morning, or catch a few words to make you smile before bed. There’s never a bad time for a good laugh, and as a Mom, you need a MOMS’ NIGHT OUT… and other things I miss! Devotions To Help You Survive. 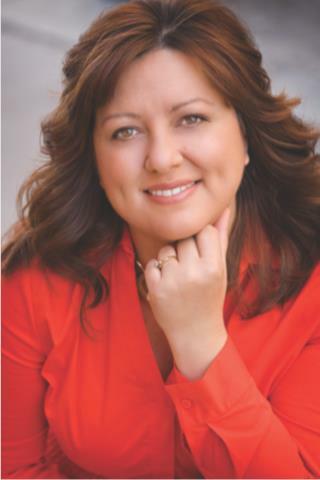 Tricia Goyer is the award-winning author of more than forty books, drawn from her experiences as a teen mother and leading voice of hope for women in today’s generation. Tricia has been married for more than twenty years and is the mother of six children. For more information, visit TriciaGoyer.com. Called Hollywood’s “God Girl,” Kerri Pomarolli is an accomplished actress, comedian, published author, Christian speaker and veteran of television—with credits that include 29 appearances on The Tonight Show and Comedy Central. For more information, visit KerriPom.com. Sometimes the loudest voices in our lives are the ones we need to silence the most. In Tracy L. Higley’s latest novel, The Queen’s Handmaid (Thomas Nelson/March 18, 2014/ISBN: 978-1-4016-8684-0/$15.99), the author explores the importance of finding our identity in God and not in the opinions of others — no matter how large of a presence those people are. This search for true identity is the foundation for The Queen’s Handmaid, a story that will take readers on an adventure through an ancient world and give them a unique understanding of the culture and setting into which Jesus was born. 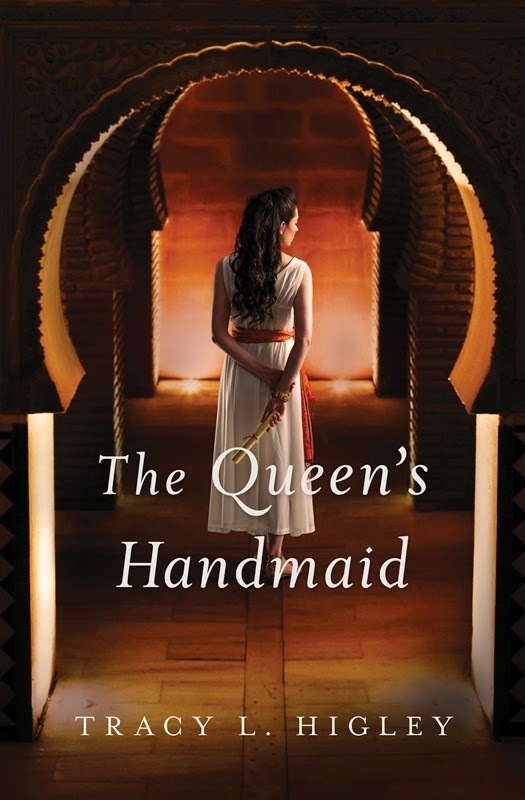 Set in Alexandria, Egypt, in 39 BC, The Queen’s Handmaid connects the history we learn in school with the Bible stories of childhood, giving readers a peek into a lost world. Q: The Queen’s Handmaid is set in Egypt, Rome and Jerusalem in 39 B.C. How did you first become interested in this time period? I find so much of ancient history to be fascinating — and I especially love connecting the world history we learn in school with the Bible stories of childhood. I loved researching this period for a previous book that featured Cleopatra, and it was fun coming back to it, to explore her relationship with Herod the Great. Q: What kind of historical research did you do in preparation for writing this book? Have you been able to travel to Egypt and/or Jerusalem where the story takes place? My research is done on a variety of levels, from quick overviews to get story ideas to deep research once I have the period, setting and historical events nailed down. And yes, the best part of my research has been travel! I’ve visited Egypt, Rome and Jerusalem, exploring the sites and getting inspired! Q: Is it difficult to create the settings in which your characters live, given that the story takes place more than 2000 years ago? I love creating the settings! One of my favorite parts of writing is being able to take readers on a journey through the sights, smells, sounds, colors and textures of the ancient world. Q: Can we expect to see biblical characters throughout the pages of this story, and if so, what was it like to bring them to life? The main biblical character readers will encounter is Herod the Great. We know him from the stories of Jesus’ birth, but for me, getting to peek behind the scenes at palace life and the mind of this man who was both a great leader and a murderous madman was challenging and exciting. Q: In The Queen’s Handmaid, your heroine is “chosen and marked for this purpose.” Do you feel everyone is marked for a purpose, and how can we determine what that purpose is? I absolutely believe each of us has a unique calling, a grand adventure planned out for us before the foundation of the world. Staying open to our own hearts and the way God both whispers and shouts His plan to us is so important. In my experience, most people have a sense of their own unique calling, but fear keeps us from it. Q: Your heroine works hard at what she does, but she doesn’t trust people easily. Are you guarded the way she is or do you find it easier to believe the best in people? I think I’m probably too trusting, actually. I’ve been blessed with many wonderful relationships, unlike Lydia’s challenges. But I know that for so many people, trusting others does not come easily. Q: You’ve said the main theme for this novel is that our identity is found in God and not in what others think about us. Is this something you’ve wrestled with, and how do you learn to care less about what people think and more about what God thinks? This goes back to trust, in my opinion. When we make people too “large” in our lives — allowing them to define who we are — we become focused on achieving and performing to please them. This is Lydia’s challenge, but I think it applies to all of us. We are all trying to gain the love and admiration of others in our lives, to feel good about ourselves. The only way we can escape this self-oriented life and really live our calling is finding acceptance and love in the God who will never fail us. He frees us up to love others well, without arranging our lives to please them. Q: What are some of the great conflicts your heroine faces that the modern-day woman might relate to most? For one, I think 2000 years later, it’s still a challenge for women to be comfortable with themselves outside the definitions of husband and family and to find their unique place in the world. Also, unfortunately, fighting against corruption and cruelty never goes out of style! To take a stand against evil for the sake of those we love is part of our calling, whether ancient or modern. Q: How does your heroine overcome her fear and live a life of courage? Practice! No, really — these things don’t come easily, do they? 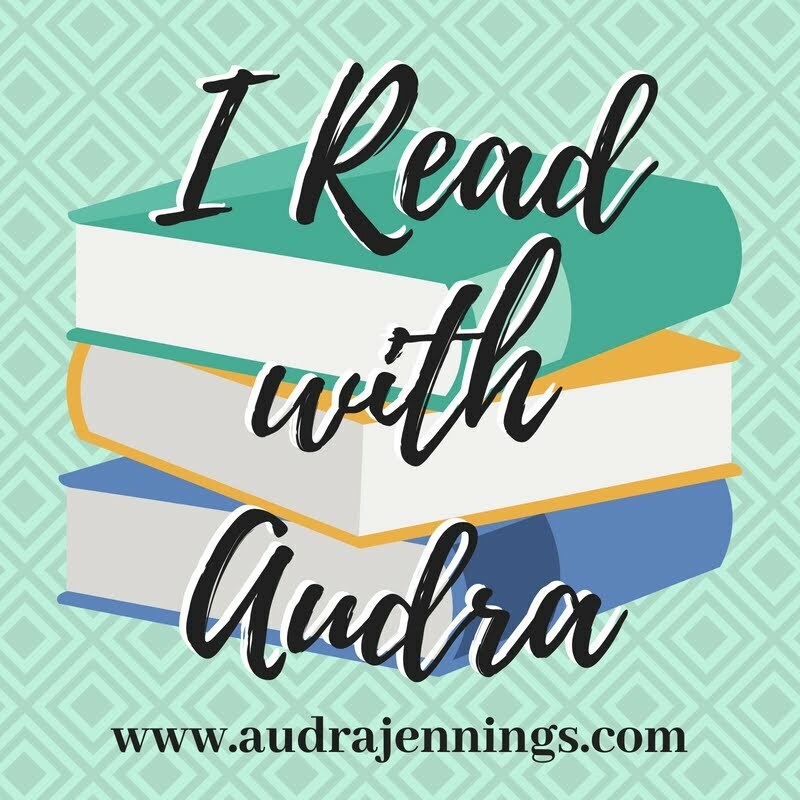 A series of challenges begins to teach Lydia about where true strength comes from, to help her see the gifts she has within herself and the God who can work through her. It’s the hard stuff that teaches, for Lydia and for all of us. Q: The Queen’s Handmaid falls into the genre of biblical fiction. Some people are leery of this category because it puts the words “biblical” and “fiction” together. How would you describe the genre, and what encouragement would you give to skeptical readers in hopes that they would give biblical fiction a try? I could go on here for awhile, but one thing I will say is that we “fictionalize” our Bible stories all the time, for the sake of understanding. Every time we picture the Christmas story with three wise men or even the innkeeper at the door, it’s an expansion of the scant details that are there. When a story expands the Scriptural record without contradicting it, we are immersed in that time and culture in a way that makes the story, and subsequently our faith itself, so much more real. Q: What do you want readers to walk away with once they turn the last page of The Queen’s Handmaid? I would hope readers leave with a sense of satisfaction with a story well-told, a broadened understanding of the culture and setting into which Jesus was born and the inspiration to go out and live an adventure of their own! For more information about Tracy L. Higley and her books, visit tracyhigley.com, become a fan on Facebook (tracyhigley) or follow her on Twitter (@tlhigley). Read more about The Queen's Handmaid here! NIGHTLINE’S Dan Harris’ 10% HAPPIER Kindle HDX Giveaway! 10% Happier by Nightline anchor Dan Harris embarks on an unexpected, hilarious, and deeply skeptical odyssey through the strange worlds of spirituality and self-help and discovers a way to get happier that is truly achievable. Dan has teamed up with his publisher, Harper Collins, for a Kindle Fire HDX giveaway. Enter today by clicking one of the icons below. But hurry, the giveaway ends on May 10th. Winner will be announced May 12th on the Litfuse blog. Learn more about the 10% Happier backstory and read an excerpt here. Don't miss a moment of the fun; enter today and be sure to stop by the Litfuse blog on May 12th to see if you won. Dan Harris is the coanchor of Nightline and the weekend editions of Good Morning America. He regularly reports for 20/20, World News with Diane Sawyer, and the weekday editions of Good Morning America. Before joining ABC News fourteen years ago, he worked for local news outlets in Boston and Maine. He lives with his wife, Bianca, in New York City. This is his first book. Find out more about Dan here! CRITICAL CONDITION Kindle HDX Giveaway from Richard Mabry! Richard Mabry's latest medical suspense, Critical Condition, is receiving high praise. USA TODAY says, "Mabry combines his medical expertise with a story that will keep you on the edge of your seat." Richard is celebrating the release with a Kindle HDX giveaway! Enter today by clicking one of the icons below. But hurry, the giveaway ends on May 11th. Winner will be announced May 13th on Richard's blog. Don't miss a moment of the fun; enter today and be sure to stop by Richard's blog on May 13th to see if you won. Dr. Frasier couldn’t save the gunshot victim on her front lawn. Now she’s fighting for her own life. It began as a quiet dinner party honoring Dr. Shannon Frasier’s colleague, but became a nightmare when a man was shot on her lawn, reviving emotions from a similar episode a decade ago. Then a midnight call from her sister, Megan, causes Shannon to fear that her sister is on drugs again. Her “almost-fiancé” Dr. Mark Gilbert’s support only adds to Shannon’s feelings of guilt, since she can’t bring herself to fully commit to him. She turns for help to her pastor-father, only to learn that he’s just been diagnosed with leukemia. With everything around her in a critical state, simply staying alive will require all the resources and focus Shannon has. A retired physician, Dr. Richard Mabry is the author of four critically acclaimed novels of medical suspense. His previous works have been finalists for the Carol Award and Romantic Times Reader’s Choice Award, and have won the Selah Award. He is a past Vice-President of American Christian Fiction Writers and a member of the International Thriller Writers. He and his wife live in North Texas. Find out more about Richard at http://www.rmabry.com/. This morning, we talked about taming the tongue from James chapter 3. After reigning them in several times, we had a good discussion and sang an appropriately themed song. They did the chorus right the time before I did the video, but I was so very proud of how well they caught on and how they were actually singing loudly. I'm not a very good videographer in the round though. For someone, who shall remain nameless, but you all know through my blog, she did well with what she learned in class until she started giving someone (thankfully not me) lots of grief at lunch. You never know what might come out of her mouth. As I have stated before, I'm not a very good teacher. She really was being funny in her teasing and wasn't actually being mean. You kind of had to be there, but she is something else. My parents, Brian, Paige, Peyton, and the Watsons (that makes 9 of us) had Easter lunch at my parents' house. I prepped pork ribs that Mom put in the oven right before church time. With an extra song and a longer than usual closing prayer, I just knew the house would be smoked up and my ribs would be burned to a crisp. It wasn't the extra 10 minutes as such, but the fact that I wasn't there to check them. However, they were fall off the bone perfect. 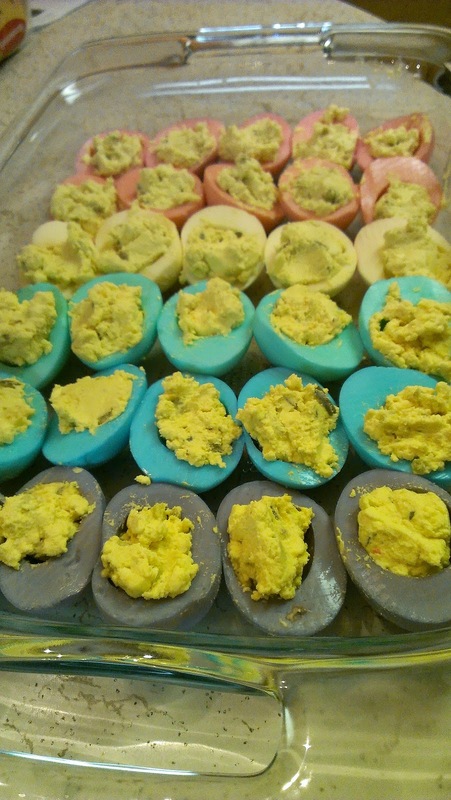 The colored deviled eggs (see last night's post) were great as was everything else. We stuffed ourselves putting to shame all the restaurants we usually frequent on Sundays. However, I've probably proven my culinary chops for a while. 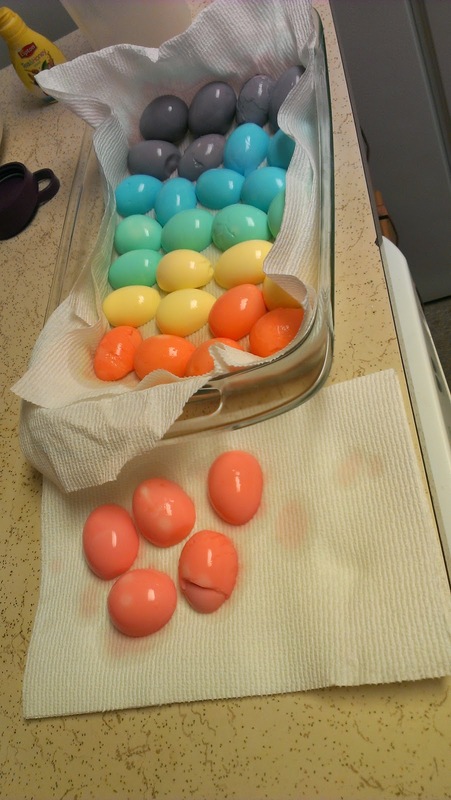 Are deviled Easter eggs somewhat sacrilegious? 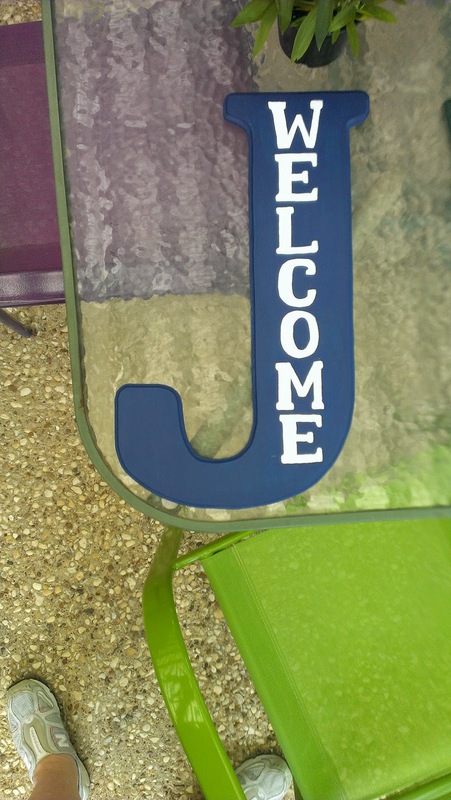 After breaking for a couple of weeks on painting letters, I finished off a couple more. Still for sell if you are interested! 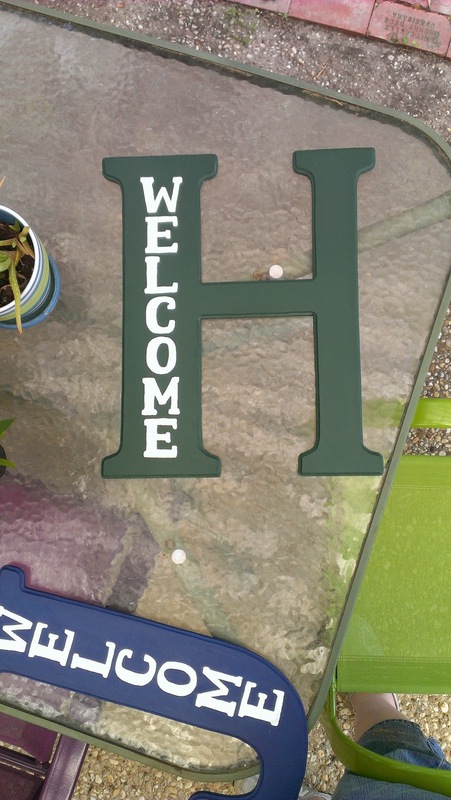 $20 with "Welcome" or your house number. Tomorrow, instead of doing our Sunday lunch out at a restaurant, I'm cooking for our crew. I have been bragging about my pork ribs, and I have those all ready to go in the oven at my parents' house in the morning. 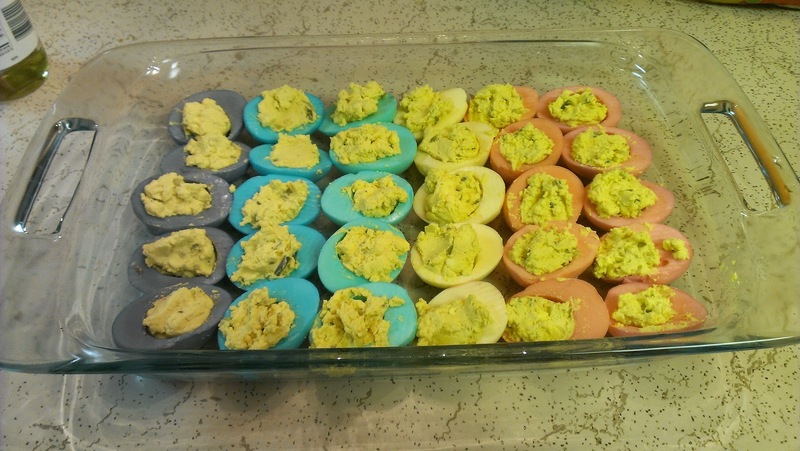 I decided to try another Pinterest project (I saw the letters on there), and make dyed deviled eggs to go with the ribs. I didn't want to use vinegar as many recipes suggested because A) I didn't have any and B) I didn't want them to taste or smell like vinegar. 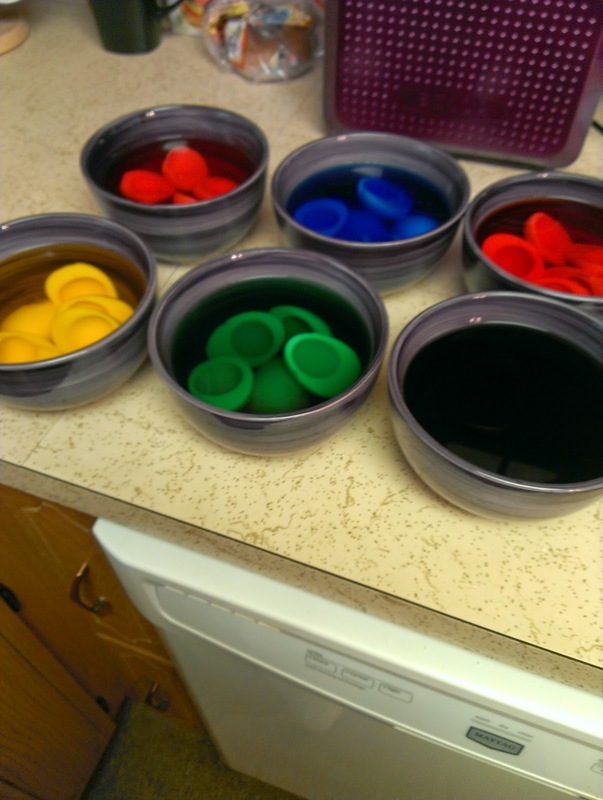 Not every pin had vinegar, but it may help them hold color. I didn't think these came out bad. I'm pretty impressed with myself. The camera on my phone doesn't do great with colors. The purple ones aren't quite so gruesome looking. Since today is Good Friday, and I didn't have to work, I took Dad looking at cars with me. I really wanted to see the color of the Hyundai Santa Fe that I was interested in, though still not absolutely convinced to commit to it. I didn't like the blue. It was no where near what the other dealership told me it would be. The car salesman there gave me the heebie jeebies, and he started the song and dance I hated. I am not sure if it was his spray tan, the food crumbs on his shirt (he had been eating almonds when we drove up) or what, but something didn't set right. Dad probably thought I was near certifiably insane. The guy went from "no where possible" to "we can get it where you want it" in about 4 minutes after supposedly talking to his manager. I would not give him my info when he asked. I know they have to track that they actually talk to people, but I told him I didn't want him calling me later, so he couldn't have my name. We were going to give him a chance, but I told Dad I wanted him to see an actual Jeep Grand Cherokee that I was interested in. 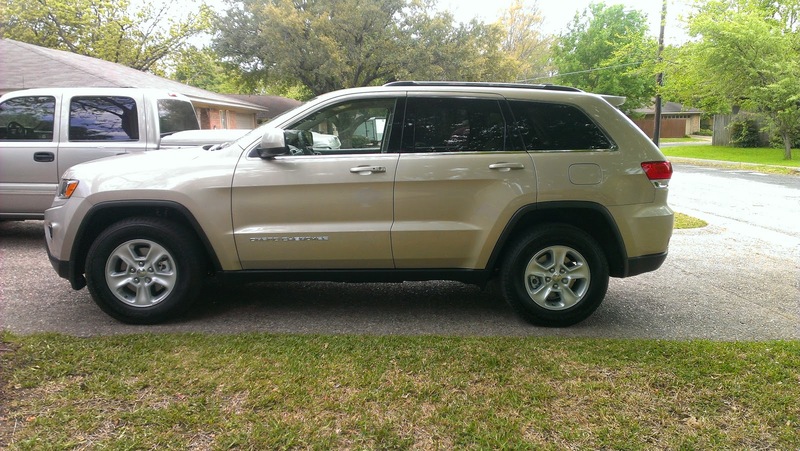 We went to the closest dealership (Dallas Dodge), and I found "Honey" (I had to nickname it on my phone app - the name is due to the color). I finally found a non-pushy salesman, Dad and I felt much more comfortable in the dealership, and I finally found a color inside (tan instead of black like all the others) and out (officially it is Cashmere) that I liked without wondering what anything else looked like. I finally came to terms with what numbers were going to be without being told what a "great deal" it was. Negotiation was smooth. I didn't have to talk to a sales manager (aka big dog aka big bully), and we liked everyone we worked with, including the finance guy. My young salesman thought I brought my dad to help intimidate, which I didn't, and was pleasantly surprised when he found out that wasn't true. He said we were the most laid back people ever (anyone that knows my dad or I either one doesn't use that word to describe us). This was the only car on the lot I looked at there. Dad said he could just tell this was it and that he probably messed me up by looking at a Santa Fe since the Jeep was what I wanted to begin with. Now, I just have to call off everyone else pursuing me when they call or email. The decor at my house tends to go through phases. At one time everything was palm trees -- I still have plenty of that. Then, purple seemed to take over. (I can make purple and palm trees work together.) But I did not paint a room purple when I moved. The latest thing is birds. I have birds in my master bedroom. My bathroom started getting a bird motif after I got the old wallpaper down. Since my birthday last fall, I started collecting owls for my dining/kitchen area. 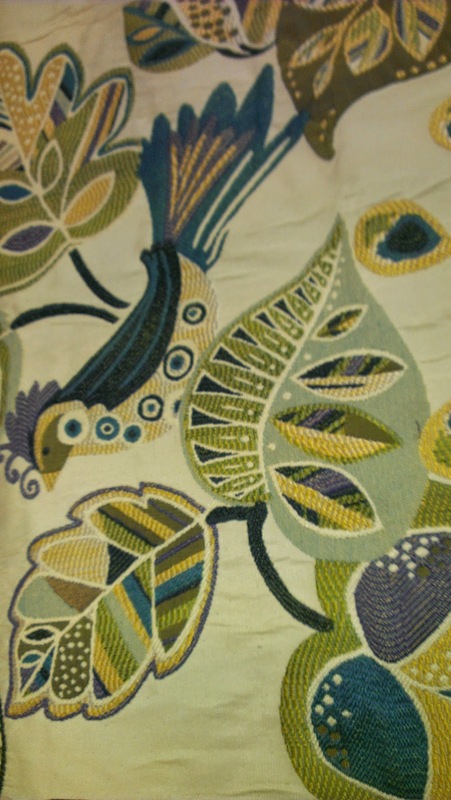 And now I found bird material to make my cushions for my purple church bench. I found it last Saturday when I was at Hobby Lobby. I couldn't resist getting it because the colors were what I wanted, even if I didn't know who was going to help me make the cushions at the time. 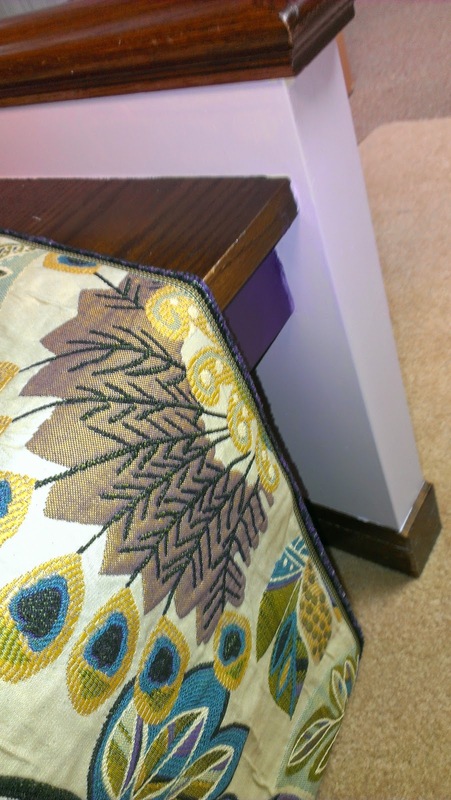 My dad doubts my sewing skills, and while I know exactly how I want to make them, I even have my doubts of sewing this particular tapestry material. You know me, always with yet another project to do. After talking to a few people who either thought I could pull it off or didn't want any part of it, the wife of one of the elders at church said that the two of us could take it on together. I'm excited! 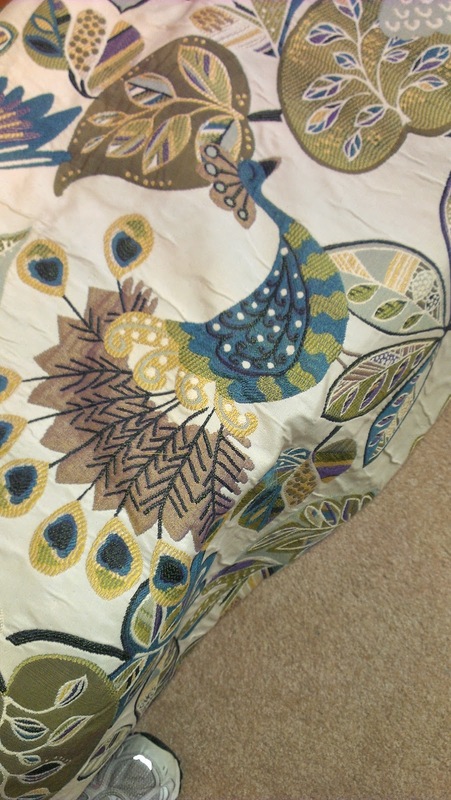 They are going to look great, but I don't know if I can get the peacock in the center of the cushion. I really like the peacock. I like his toucan, parrot and other friends too. I just wish my camera on my phone held to true colors. 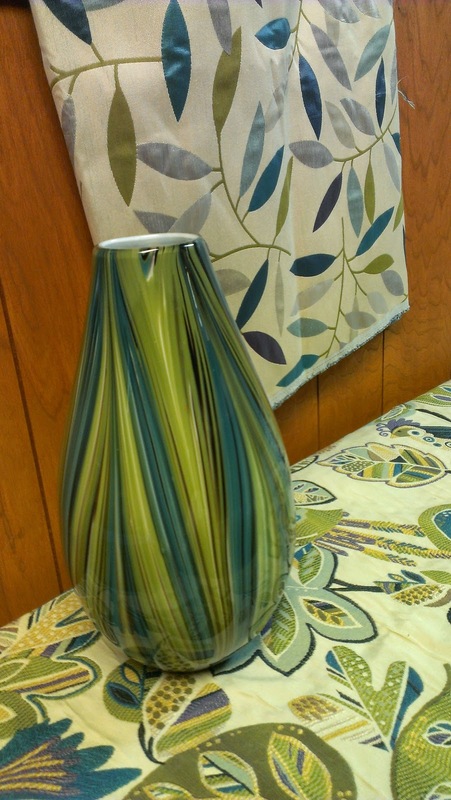 But, see how close he matches the vase I already had? 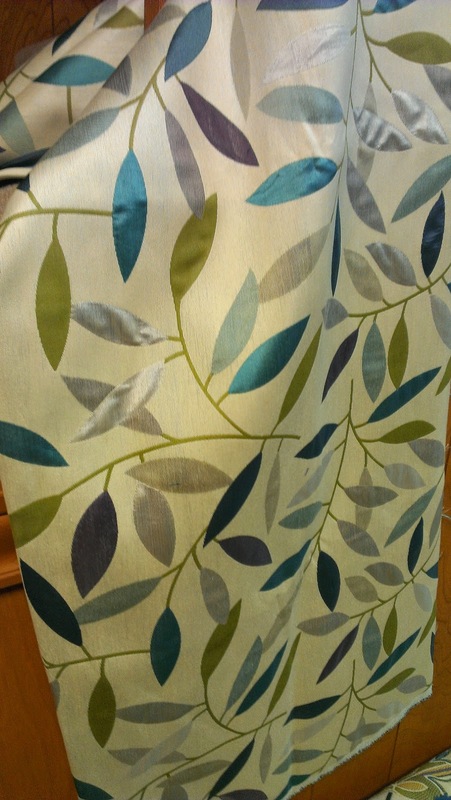 The leaf material is for curtains on the window at the bottom of the stairs. Now touring Pam Hillman's Claiming Mariah!